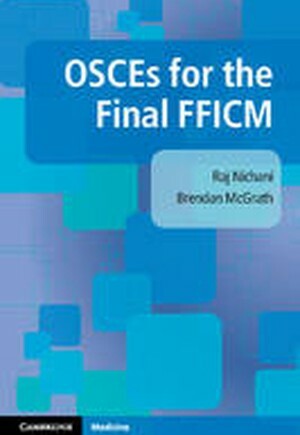 This study guide includes in-depth coverage of past FFICM exam material, and is an invaluable resource for trainees preparing for the OSCE examination in intensive care medicine. A structured layout gives the reader clear and convenient access to a wealth of model questions and answers that can be used for quick-fire practice or more detailed study. The book is divided into four sections covering data interpretation, equipment, ethics and communication, and resuscitation and simulation. Questions have been matched to the curriculum, ensuring accurate and comprehensive revision guidance, and a sample marking scheme is provided to assist with exam preparation. Incorporating recommendations from the FFICM Court of Examiners, additional data analysis, images and ECGs are included to build on common areas of potential improvement. Part I. Data Interpretation: 1. Acid base; 2. Methaemoglobin; 3. Infective diarrhoea and toxic megacolon; 4. Major burn; 5. Ruptured hemidiaphragm; 6. Post cardiac arrest; 7. Necrotising fasciitis; 8. ARDS; 9. Stridor; 10. Hyponatraemia; 11. Chest drain in liver; 12. Interpretation of pulmonary function tests; 13. Serotonin syndrome; 14. Propofol infusion syndrome; 15. Guillain-Barré syndrome; 16. Epidural management; 17. Panton-Valentine leukocidin (PVL) MRSA pneumonia; 18. Surviving (urological) sepsis; 19. Ventilator associated pneumonia; 20. Refeeding syndrome; 21. Acute coronary syndrome and papillary muscle rupture; 22. TTP/HUS; 23. Subarachnoid haemorrhage; 24. Post oesophagectomy anastomotic leak; 25. Pulmonary embolism; 26. Heparin-induced thrombocytopenia; 27. Brainstem death; 28. Tricyclic overdose; 29. Chest pain assessment; 30. Intra abdominal hypertension; 31. Selective decontamination of the digestive tract; 32. Bone marrow transplant; 33. Acute kidney injury; 34. Broncho-pleural fistula; 35. Myasthenia gravis; 36. RV infarct; 37. Rhabdomyolysis; 38. Cerebrovascular accident; 39. Acute leukaemia; 40. Diabetic keto acidosis; 41. Failure to wean; 42. Pleural effusion; 43. ICU follow up clinic anaemia; 44. Acute liver failure; 45. Cirrhosis with upper GI bleeding; 46. Sedation and sedation scoring; 47. Encephalitis, epilepsy and MRI scans; 48. Acute renal failure in a HIV positive man; 49. Digoxin toxicity and cardiac pacing; 50. Acute pancreatitis; 51. Cortisol and thyroxine in the critically ill; 52. TEG and major haemorrhage; 53. Poisoning; 54. ECG interpretation; 55. CXR interpretation; Part II. Equipment: 1. Arterial lines; 2. Tracheostomy weaning and communication; 3. Bronchoscopy; 4. Cooling devices; 5. PA catheter; 6. Naso gastric tubes; 7. High flow nasal cannula; 8. Cardiac output technologies; 9. Catheter related blood stream infection and vancomycin-resistant enterococcus; 10. Spinal needles; 11. Capnography; 12. Patient transfer; 13. Tracheostomies; 14. Central lines; 15. Haemofiltration; 16. Intra aortic balloon pump; Part III. Ethics and Communication: 1. Anaphylaxis; 2. Pulmonary embolism; 3. Malignant hyperpyrexia; 4. Organ donation; 5. End of life care; 6. Muscular dystrophy; 7. Delirium; 8. Deterioration post discharge; 9. Consent for tracheostomy; 10. Blood transfusion; 11. Alcoholic liver disease; 12. Long QT; Part IV. Resuscitation: Introduction; 1. Displaced airway; 2. Child submersion; 3. Child with seizures; 4. Bleeding trauma with head injury; 5. Asthma; 6. Pregnancy and VF arrest; 7. Chest opening on the ICU; 8. Paediatric sepsis; 9. Tracheostomy emergency; 10. Anaphylaxis.